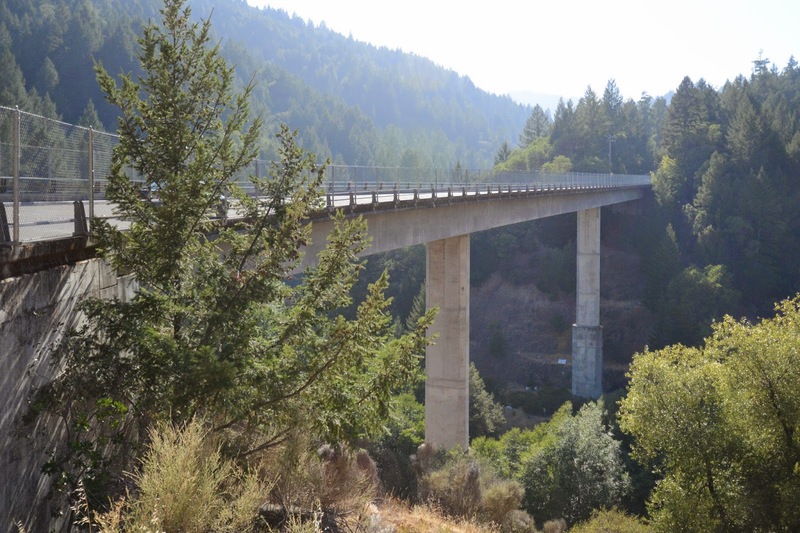 Sonoma County becomes remote and mountainous west of the Rockpile Bridge with just a few extremely winding roads. Driving west we arrived at the Skagg Springs Road Bridge (20C0439) across Warm Springs Creek. It is a tall continuous 3-span prestressed concrete box girder bridge on single column bents that was built in 1978. The bridge is 604 ft long with a 234 ft long span over the creek. It's in good condition and carries about 400 vehicles a day. Sonoma County, California Bridges: Skagg Springs Road Bridge across Warm Springs Creek by Mark Yashinsky is licensed under a Creative Commons Attribution-NonCommercial-NoDerivatives 4.0 International License.